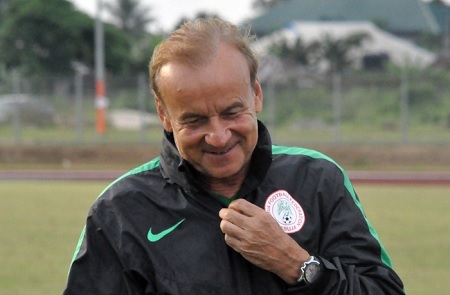 Gernot Rohr, the Chief Coach of Nigeria's Super Eagles on Monday released his 30-man provisional list for the 2018 World Cup in Russia. On the list includes Crotone striker Simeon Nwankwo and Kano Pillars forward Junior Lokosa on the list. The German had insisted that the players who played the qualifiers were top on his priority list, adding that the local league players had “a little chance” of making the squad to Russia. And Rohr stuck to his word, with only Amkar Perm left-back, Brian Idowu, Lokomotiv Plovdiv big defender, Stephen Eze, and Joel Obi, the other players included in the squad that weren’t part of the qualifiers. He had said, “The surprises can only come if some players are doing so well and we have to take them, it will be wonderful to see some surprises. But the players who brought us to the World Cup without any defeat are the first choice now. China-based captain Mikel Obi leads the squad having fellow midfielders Wilfred Ndidi, Ogenyi Onazi, John Ogu, Oghenekaro Etebo, Joel Obi, Mikel Agu and Uche Agbo. The goalkeeping area, which has given Rohr cause for concern recently, has the 19-year-old Francis Uzoho, Daniel Akpeyi, Ikechukwu Ezenwa, who kept in four of the qualifiers, and Plateau United’s Dele Ajiboye, despite calls for the coach to extend an invitation to experienced Israel-based duo Austin Ejide and Dele Aiyenugba. In attack, Al Ahly forward Junior Ajayi was left out alongside Malaga striker, Brown Ideye, with the coach preferring to give Lokosa, who has scored 18 goals in 20 games in the domestic league, and Nwankwo, who grabbed seven goals in 22 Serie A outings in the outgoing season, their chances to make the trip to Russia. Chelsea forward Victor Moses leads the forward line that consists of Nwankwo, Odion Ighalo, Kelechi Iheanacho, Ahmed Musa, Moses Simon and Alex Iwobi. The defence has Turkey-based Kenneth Omeruo, William Troost-Ekong and Shehu Abdullahi while Cercle Brugge’s 30-year-old Elderson Echiejile, Leon Balogun, Ola Aina, Tyronne Ebuehi, and Nantes centre-back Chidozie Awaziem also made the cut. Only six players in the provisional squad have previously represented Nigeria at the World Cup. Mikel, Musa, Moses, Onazi and Omeruo were at the 2014 World Cup while Echiejile played at the 2010 edition in South Africa. Chippa United keeper Akpeyi, who clocks 32 on August 3, is the oldest member of the squad.